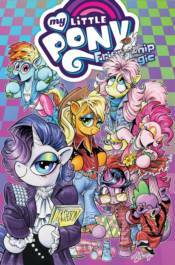 Fluttershy and Rarity travel to Manehattan where Rarity is shocked to discover old, ugly fashions are back in style! Princess Celestia disguises herself to live amongst ordinary ponies for a day. What she learns about her subjects, and herself, will surprise her! Plus, Twilight and friends are surprised to learn that a film is being made about them! When the story turns out to be less than accurate, the group decides to make their own film! Collects issues #64-68 of the ongoing series. ? Advance solicited for November release! MY LITTLE PONY: FRIENDSHIP IS MAGIC - IT'S AN APPLEJACK HOEDOWN MY LITTLE PONY: FRIENDSHIP IS MAGIC - SPARKLE BEYOND BELIEF!